Kelli Mulhollen Dumas is seen with her son Michael. Michael has been fighting a hookworm infection for more than a month after leaving a Florida beach, his mom says. A mother concerned for her son, who she said contracted hookworms from a Florida beach, said her first calls to health officials weren't taken seriously. After sharing a now-viral Facebook post and contacting national and state officials, she's been told an investigation is underway. 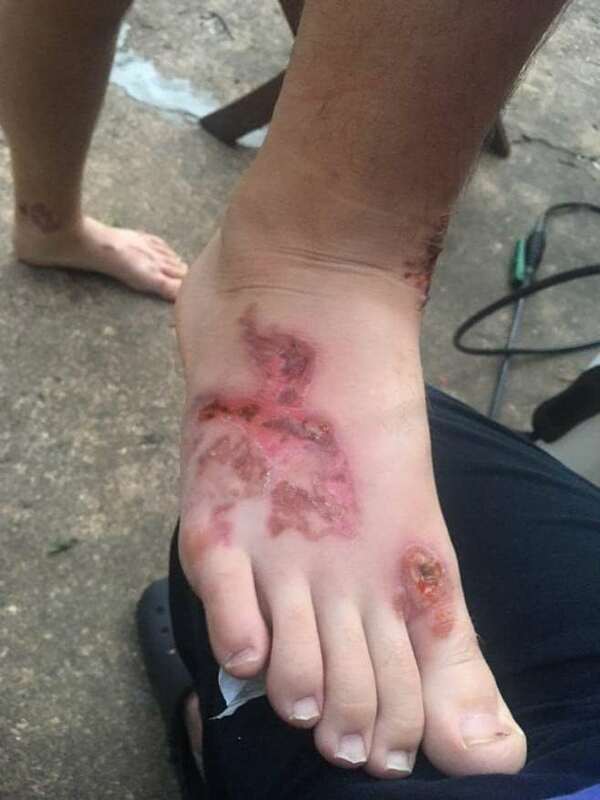 Kelli Mulhollen Dumas said her son Michael developed a painful infection after returning from a mission trip that included time at Pompano Beach on June 18 and 19. Each visit lasted about 20 minutes. "He was buried in the sand for fun and it has become our nightmare," she posted on Facebook, with graphic images of her son's inflamed skin. When her son contracted hookworms from a Florida beach, Kelli Mulhollen Dumas said her first calls to health officials weren't taken seriously. By Michael's 17th birthday on June 20, he was fighting a terrifying parasitic infection on his feet and legs. And he's still struggling. He's developed a staph infection and is bathing in bleach daily, his mom told USA TODAY. He has trouble walking and is virtually house-bound. Six out of 17 people traveling with her son were infected with hookworms, Dumas said. One case was just diagnosed July 23, she said. Dumas told USA TODAY she called the Florida Department of Health in Broward County on July 16, a week after a doctor confirmed Michael's hookworm infection. Dumas said she left three messages that went unanswered and finally spoke with a supervisor on July 17, who told her a warning would not be issued. Dumas, a dentist for more than 30 years, said a few days later, she called the Centers for Disease Control and the main office of Florida Department of Health. The state department told her they have now opened an investigation and requested to speak with all of the individuals who were infected. Candy Sims, a public information officer with the Florida Department of Health in Broward County, said the department is “looking into this inquiry,” but did not comment further. Hookworms burrow into the skin, causing a red and itchy reaction that can last weeks until the larvae die and in rare cases, can inflame the intestine, according to the CDC. Dumas, a single mom, said she’s had to pay over a thousand dollars for medication. "We have no idea how long this is going to take to heal but he has taken four antibiotics, two antiparasitics and a steroid pack and he is going to be permanently scarred from this situation," Dumas told USA TODAY. "I don’t want anyone else to unknowingly have the same disease happen to them."